I’ll be in church on Sunday NOT to wallow in my own circumstances, or draw off attention to myself, BUT to transcend my personal bubble, and engage with both the universal and the eternal – it’s not about me ! Briefly stated: We believe in ONE God, who reveals Himself, fully and equally, in three PERSONS: God, the Father; God, the Son; and God, the Holy Spirit. When I published this on Ready Writer, I added: “Unashamedly Trinitarian, I am deeply grateful for the remarkable insights contained in William P. Young’s allegorical work: “The Shack” – which is available in both book or DVD format, and which I’m happy to recommend. The Father is Source, the Son is Centre, the Spirit is Home — and to know Him, to grow like Him and to make him known is my life’s vision and purpose. and the Spirit who makes us holy. one God, infinite in majesty. I’ve been a Christ-follower since my teens, in the mid-1960s, and marvel at the vast range of hymns and spiritual songs out there, pertinent to all kinds of moods and seasons. Just occasionally in recent years I’ve come across a ‘belter’ that I’ve never heard before … this is one such. Its lyrics are special … yes, one of those you wished you’d written yourself !! So it’s with great enthusiasm that I commend Joy Dine’s brilliant hymn to you. In a ‘meter’ which fits with many ‘well-known’ tunes, I find “Ode to Joy” as appropriate as any – do enjoy and let it speak for itself. marks the way that Christ defined. focused on the Jesus light. choosing treasure that will last. Christ our goal and Christ our guide. With that as a backdrop, I’d like to share something of our personal journey. Meeting my wife, Sue, 44+ years ago, as students at Bible College, we were married 2 years later and moved to Immingham to serve the Lord. We were blessed with two children: Miriam born in 1977 and Mark, born 14 months later – both arrived safely at the Croft Baker Maternity Hospital in Cleethorpes – and so our adventures in parenting began over 41 years ago – what a roller-coaster. Much of it was a matter of ‘trial and error’ – our error was their trial ! Years later Mark met and married Michelle – a young lady whose family attended our church during our ministry season in Brigg. In the first 5 years of their marriage they produced 4 grandsons. The oldest, Daniel is 12 at the time of writing. So, added to our parenting experiences we’ve had 12 more years learning the joys of being grand-parents. Additionally, we spent all of our married life caring for others in a professional capacity – Sue as health-care professional and I as a ‘church minister’, and even since leaving paid ministry our commitment to parenting has continued. We’re delighted to have been ‘adopted’ by a Nigerian daughter, and more recently, by a Ghanaian son, who pastors a growing church in the vicinity. However, 6 months ago, one Thursday in early September 2017 our journey took an unexpected twist. Sue attended the Cancer Support Group which she’d helped to initiate, and which meets weekly at our local Library. For some weeks she’d been accompanying a lady through her personal cancer trauma. On this occasion, the lady, who happens to be a foster parent shared that her greatest grief during the whole period, was the temporary removal of her foster children, deemed necessary to allow her to receive vital treatment. After offloading her burden, she said to Sue, “You would make a great foster parent – you are such a good and caring listener”. On her journey home, Sue pondered these words & they took hold of her. Yet she had serious doubts about my agreement with such a course of action. I was very taken aback when the thought crossed my mind: “We could do this”, and, of course, with hindsight, I was being set up for Sue’s return ! You may imagine the conversation which followed, in which we decided to ‘try the door’. The main assessment, with weekly visits from a different social worker – each lasting 1-2 hours, with loads of form-filling, questions, discussions, voice-recordings – no stone left unturned. A Panel Interview – still to be arranged, as I write, which will give its approval – hopefully ! I’ve shared this because we’d appreciate your thoughts/prayers as this exciting, and challenging journey in ‘parenting’ continues. 70 years is a vast amount of time … if you’re aged 70 or above I honour and congratulate you. For 70 years God’s ancient people endured ignominious captivity in Babylon, before being permitted to return to their homeland. Many of those who returned were born in captivity, had never seen ‘the land of promise’, and were entirely dependent on childhood stories, which fired their imagination and longing for the ‘home’ they’d never known. Psalm 126 is a short piece describing the emotions of that return from captivity, the adversity faced on arrival, and the hope brought to them by prophetic input. The euphoria of ‘deliverance’ is more often than not tempered by discovering the true state of things (our hearts, our circumstances, for example) and may produce severe anxiety over the future. Lyrics of a ‘Verve’ song are quite pertinent: “It’s a BITTER-SWEET symphony, this life”. The contrasting ‘moods’ of previous verses take another twist on this winding journey in our final verse, with the ‘prophetic’ use of a powerful word: “DOUBTLESS” – the original Hebrew text suggests this word which is beautifully picked up by the translators of our Authorized Version. What fresh hope this word births – what new confidence it inspires – what a firm foundation for faith it offers – what outstanding encouragement – “DOUBTLESS”. As people of God, ours is a faith journey within a community of faith – facing our hardships with perseverance, while trusting the Living Word and the Spirit of God, we work hard, we sow our seeds, we weep over the hardness of our own hearts, and of others, we commit ourselves to God, casting ourselves on His unfailing love. As the “DOUBTLESS” kicks in, we may grow in the certainty that our ‘toil’ is not in vain, and that we will reach the moment of HARVEST. 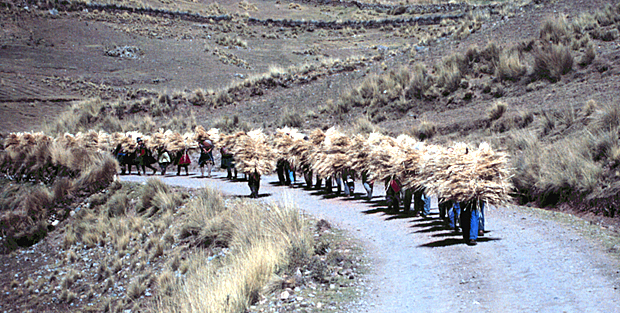 Having carried seeds, we will carry sheaves, too. What remarkable evidence of God’s providential care for the natural creation – watering, enriching, filling, drenching, leveling, softening, blessing and crowning. This being so, how much more does He care for us, described as His new creation in Christ. REMEMBER THIS: God has not brought you out of captivity in order to fail, but in order to bless you and cause you to increase – DOUBTLESS.